Which as they kiss consume. Juliet Capulet didn't take her own life. She was murdered by the person she trusted most, her new husband, Romeo Montague, who made the sacrifice to ensure his own immortality. But Romeo didn't anticipate that Juliet would be granted eternal life as well, and would become an agent for the Ambassadors of Light. For seven hundred years, Juliet has struggled to preserve romantic love and the lives of the innocent, while Romeo has fought for the dark side, seeking to destroy the human heart. Until now. 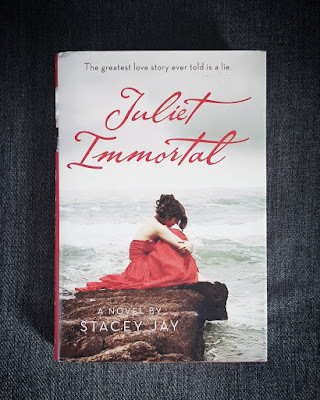 Secrets unfold and surprises abound in Stacey Jay's powerfully dark romance, which reunites literature's most tragic couple. I've been interested and curious about this book for quite some time. I am a sucker for Romeo & Juliet. I've always loved the story. When I was little, I watched the Leonardo DiCaprio and Claire Danes version so many times that my mother actually stopped letting me watch it. I later bought the movie in my teens and still watch it today. So it's safe to say that this hooked me in and I was dying to read it. "The greatest love story ever told is a lie." How could I not want to read it after that tagline? I read the book really quickly. In one day, actually. It was very well written and the story was great. It was a great and interesting twist to the love story we all know (or have at least heard of). Stacey Jay had an awesome imagination. The characters she created are dark and beautiful. The story was hauntingly good and left me wanting to seek out more fiction based on Shakespeare's characters. Definitely a book I would read again.